Ah, yes. 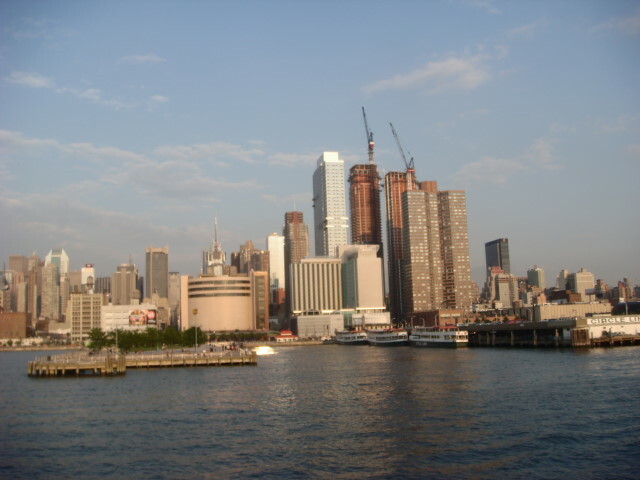 My third and final posting about my June cruise around most of Manhattan. Part one detailed the late afternoon views; part two detailed the twilight views. So, that makes this the evening post. 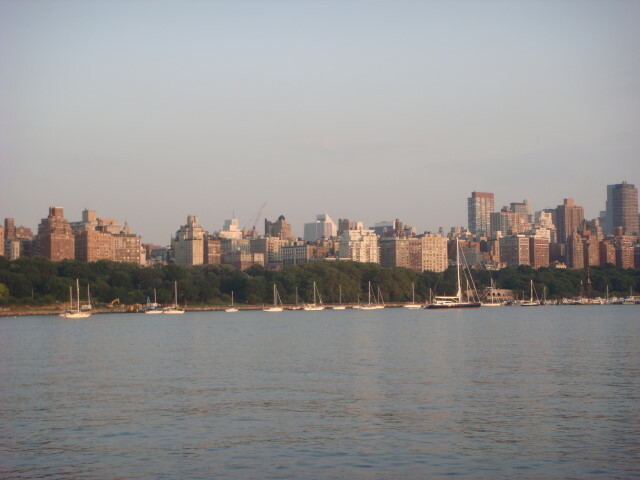 And to start it off, here’s the tippy-tippy-southern-tip of Manhattan…seen from a few hundred yards further south. I even caught a couple of other boats in the picture. At this point, we entered the East River side. Yeah, you can name this bridge despite the poor lighting. Yup, it’s the Brooklyn Bridge. You’ll notice that these pictures are just a bit more unfocused than usual. Blame the poor light and the choppy water (and maybe, just a little, the photographer). 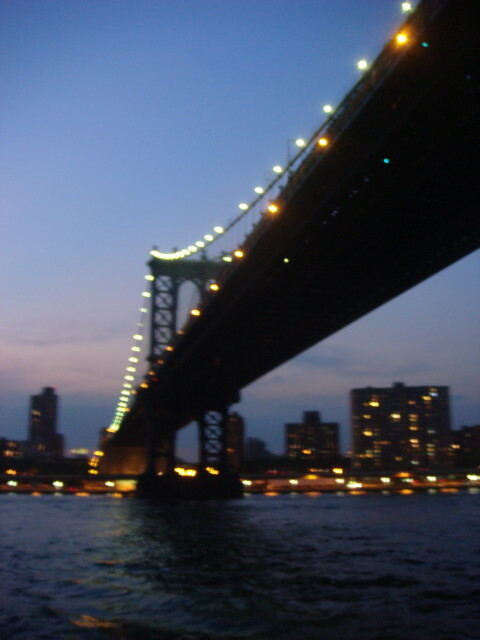 Nevertheless, this next picture of the Manhattan Bridge [corrected] just couldn’t be left out of the posting. The angle is everything. 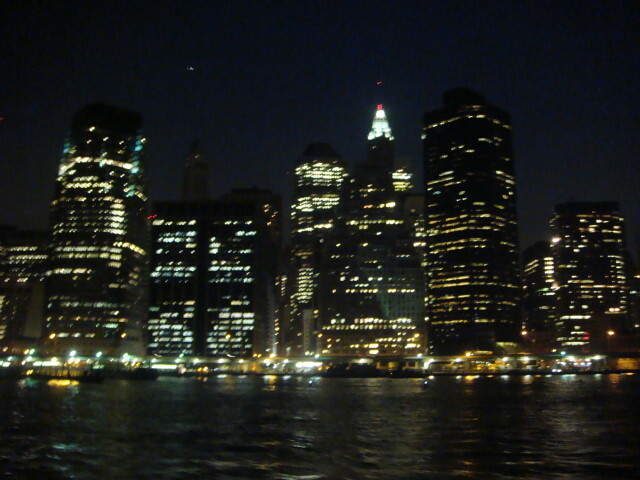 As we went up the East River, I saw a couple of buildings way in the distance that had some odd lighting about it. I photographed it a bunch of times, but the only one I’ll put up is the next picture. This is about as close as we got. 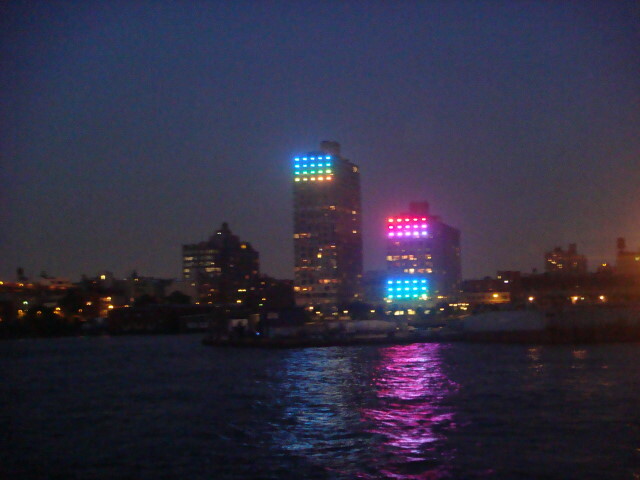 The neat thing about these is that the lights and their colors were slowly changing. Just slow enough that I seldom caught them in transition. That’s what made it so good. I’m sure they’re famous, but I haven’t any idea as to what and why they are the way they are. The buildings are in Brooklyn, not Manhattan. 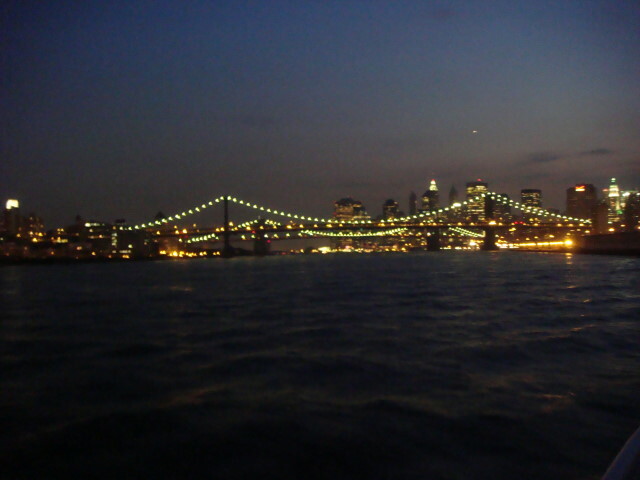 For the next picture, we were heading back south and could see the Manhattan and Brooklyn Bridges. 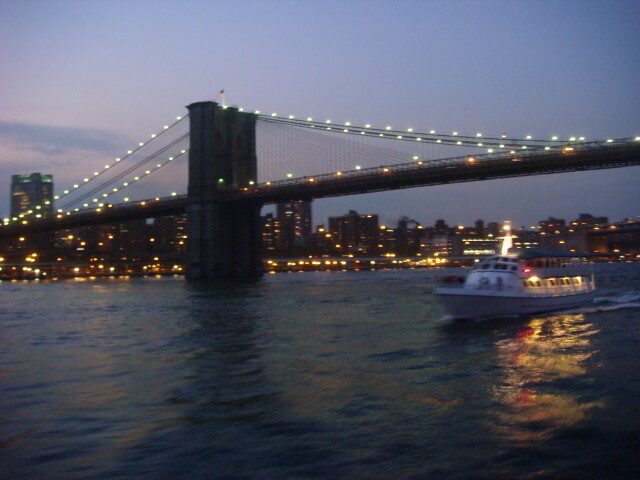 There are three major bridges in southern Manhattan. Easily remembered for their names and position: BMW. Brooklyn, Manhattan, and Williamsburg. Williamsburg is the furthest north. At the time of the next picture, the sunlight had well and truly faded away. It left only the light of the City to picture. I’ve done the cruise before and sights like this always make me a little awed. And speaking of awe and pride. 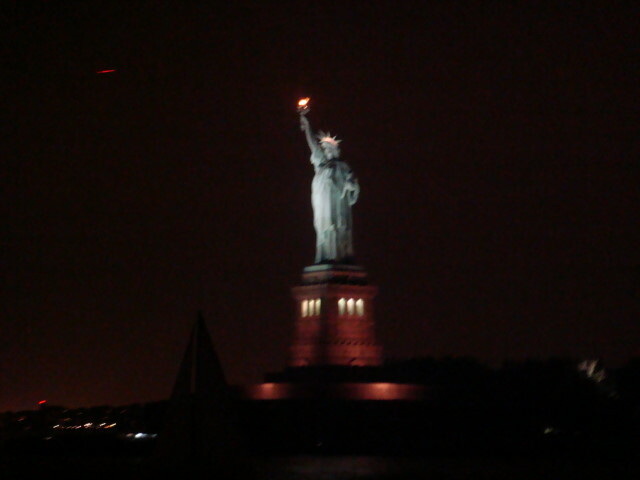 One of the last things we did on the cruise, and the last picture I’ll share from that night: the Statue of Liberty. I haven’t posted a number of my photos from my June cruise around Manhattan and I think it’s time to make up for some of that. My previous photos were a little more daytime and covered the uptown to midtown west portion of the City. 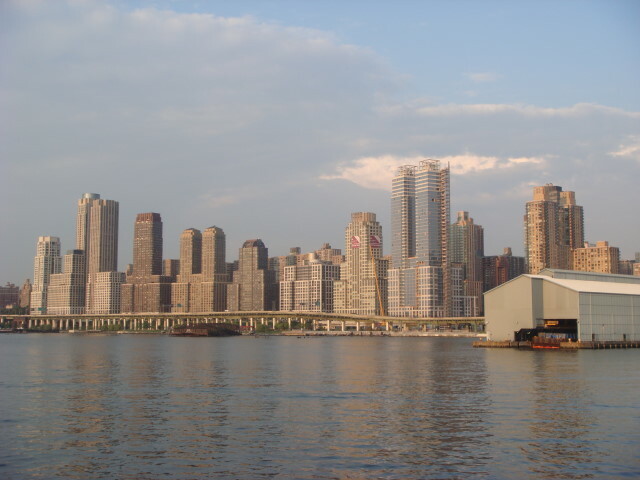 Today’s post will still cover the western side of Manhattan on the Hudson (remember: Hudson on the west side, the East River on the east side). I was lucky during the cruise to see and photograph a number of other boats. 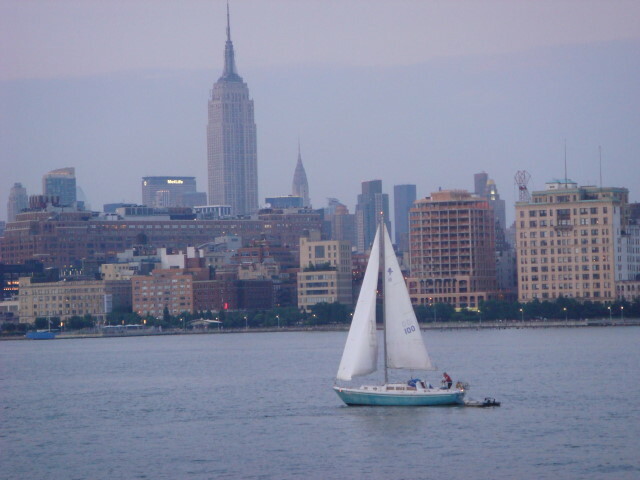 And what better kind of boat to picture than a sailboat against the skyline? In this case, a tiny sailboat against the Empire State Building. A little further south and we were approaching southern Manhattan where the two rivers converge into the bay. 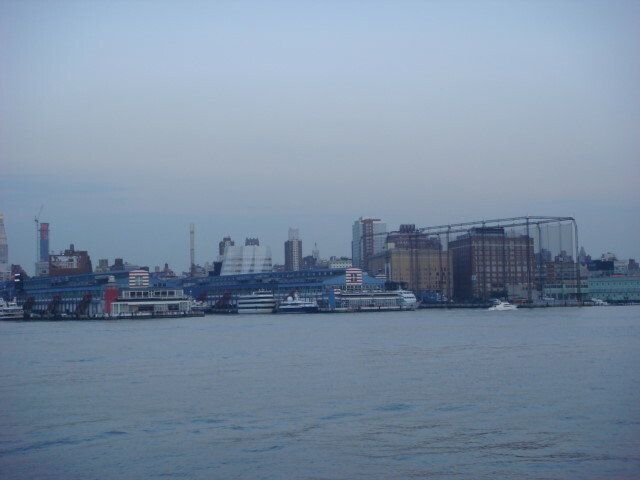 And on the way there, I took another picture of another cruise ship (like the one I was on) against the skyline. This part of the skyline ain’t that great, but you can see the Empire State building starting to turn on its lights in the far left side of the photo. 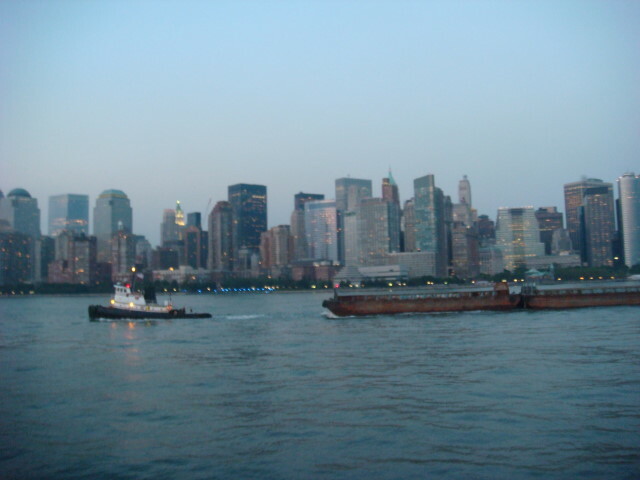 And since I was in the Hudson, there wasn’t any reason not to take a picture of New Jersey across the way. I don’t know the name or purpose of the clock, but it is very cool. And catching a nice sailboat in the same picture makes it even better. 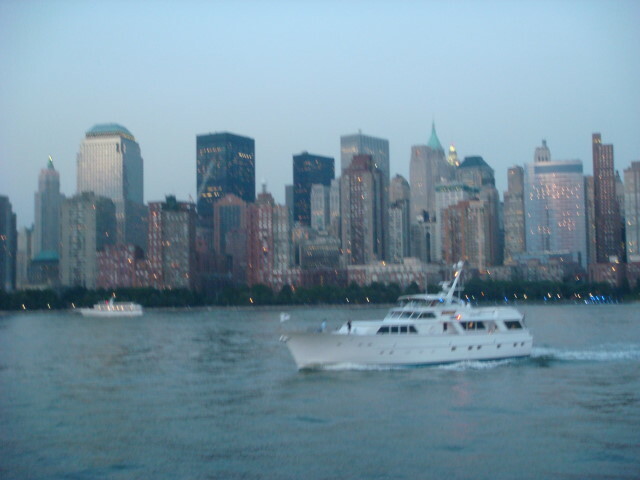 But the next is actually the kind of picture I was looking for: a yacht and a great skyline. I suppose it is actually a commercial vessel like the one I was on, but I like to think of it as a yacht. Other traffic shared the river with us. 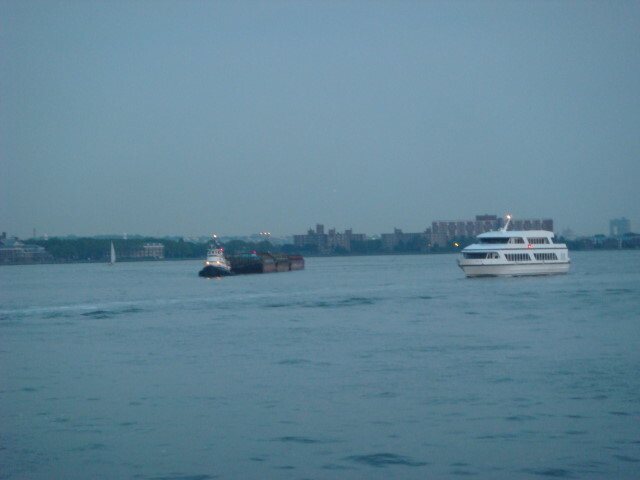 In this case one of the few barges I saw that day and one of the many cruise boats doing just what the one I was doing: going part of the way around Manhattan. You just have to love the next picture. Okay, maybe not; but it is a nice reminder of the City and the money in the area. 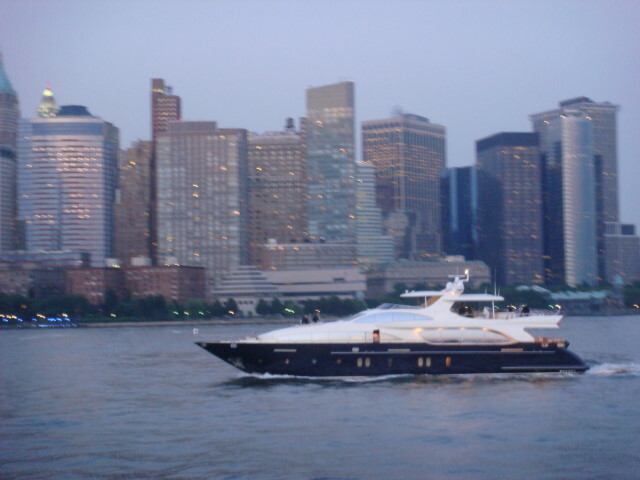 Okay, maybe it’s a reason to not love the place…In any case, I like this one as the ultimate yacht and skyline that I took that day. 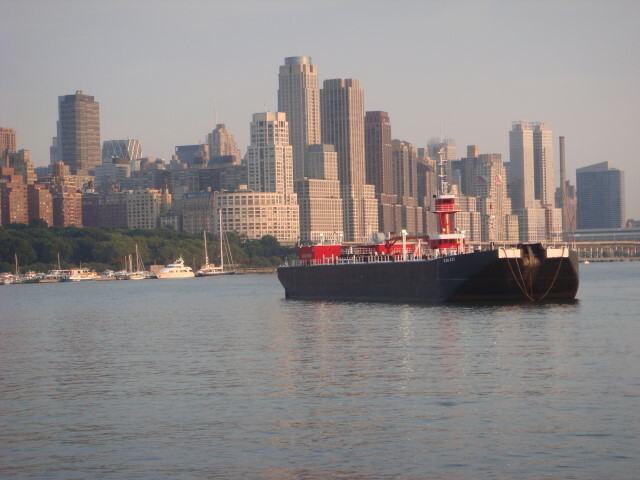 Next is a more pedestrian picture of a tugboat pulling a barge…but with that great skyline. 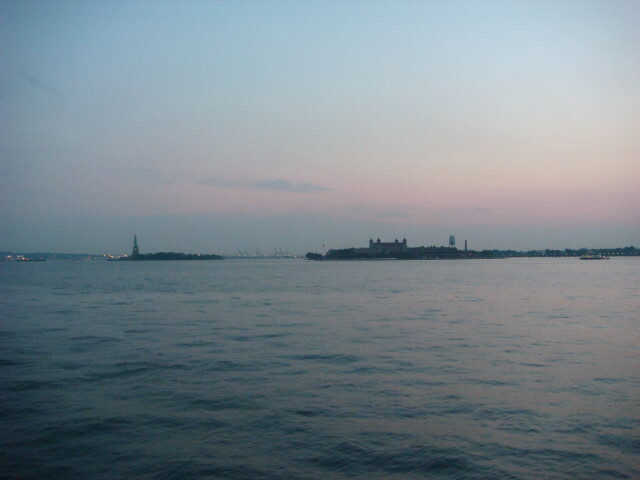 Today’s last picture is a twilight picture of the Statue of Liberty and Ellis Island way in the distance. The above picture was taken at about 8:45pm. This pretty much ends my twilight photos. The next set of photographs on this trip are definitely taken at night. I don’t know when I’m actually going to post it, but it will come sometime relatively soon. But not for a little while. 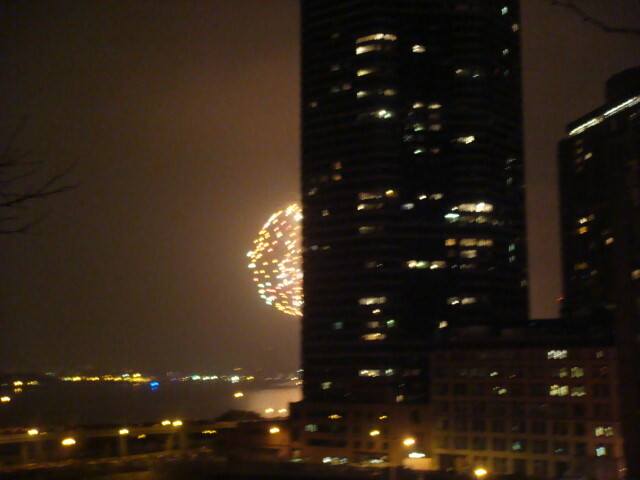 Happy 4th to you…although I’m posting this so late it probably won’t be seen by anyone until the 5th. But that’s okay. I only got to see about 75% of the fireworks (although I saw the whole show) so, on balance, seeing 3/4’s of the fourth on the fifth is the fourth. Right? That’s way too wordy and idiotic. I oughta just delete it, but it’s late and I need to make my post. 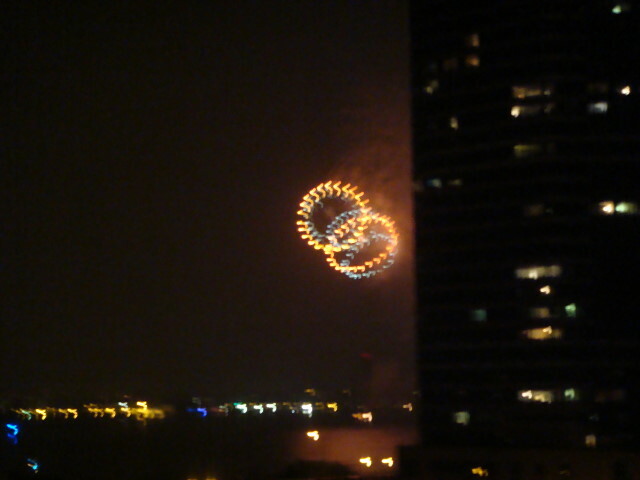 Anyway, I went out to see the fireworks, but there was something of a problem. Yeah, a building was partially in the way. So, I only got to see about 3/4’s of any explosion. It was also raining a little. Fortunately, not enough to spoil the show, but enough to make the end of the fireworks highly anticipated so we could get out of it. 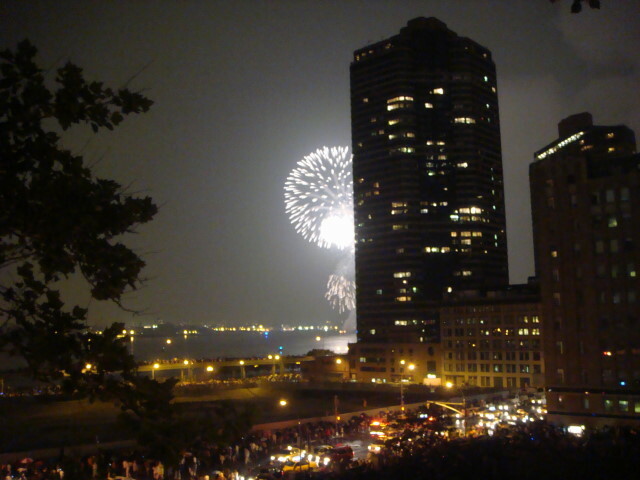 There only seemed to be one boat firing off the fireworks (it was anchored in the middle of the East River). I should have recorded the TV show to see if there were others further to the south. I looked to see if I could detect another one, but didn’t see anything. 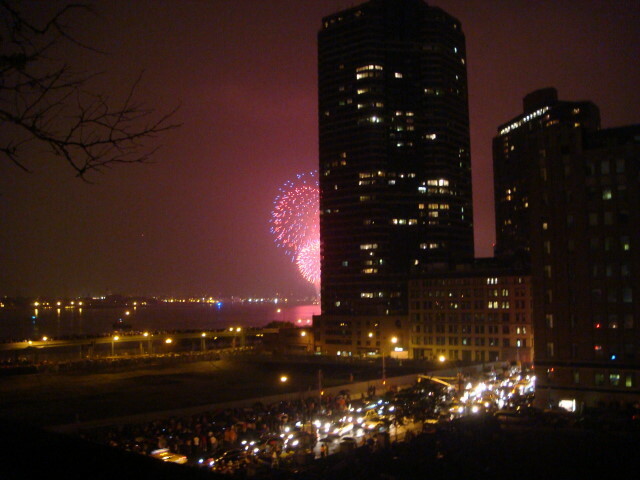 The bit that was interesting was before the show, we could see lots of fireworks going off miles and miles away in Brooklyn and Queens. A couple of them seemed to be pretty big shows. I suppose one of them could have been in Coney Island (I believe I’ve heard it has a good show, too). 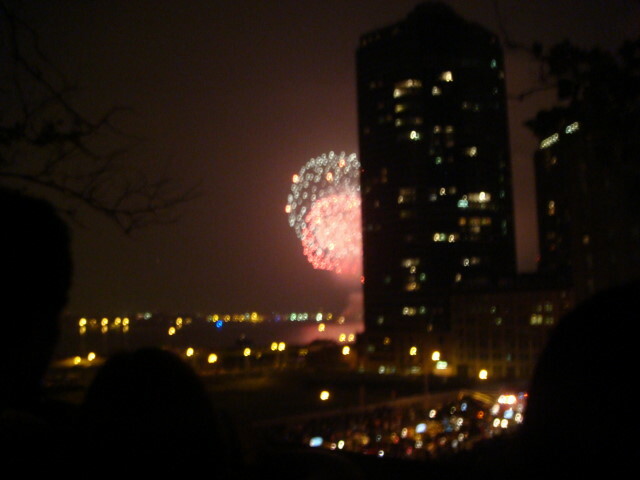 But the East River show is the big’un. The show was done well. It escalated nicely and there were a few well-deserved gasps when it hit the occasional cresendo. The crowds at the center of the action usually have a musical accompaniment; but nothing for us on the far edges of the show. 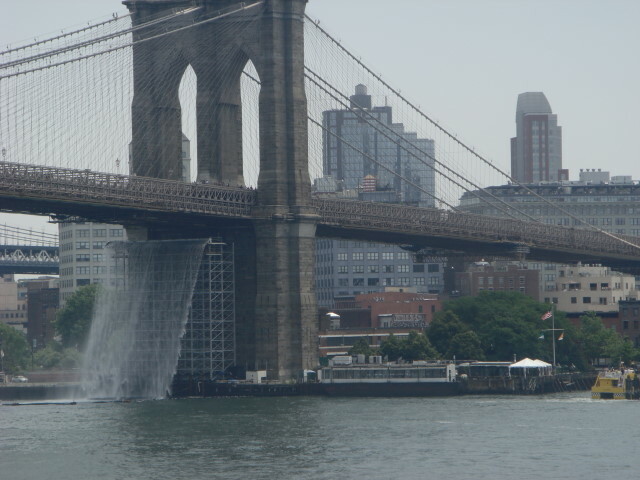 It appears that some Danish/Icelandic artist by the name of Olafur Eliasson set up four waterfalls near Manhattan. I can now attest to two of them. I don’t know about the others. 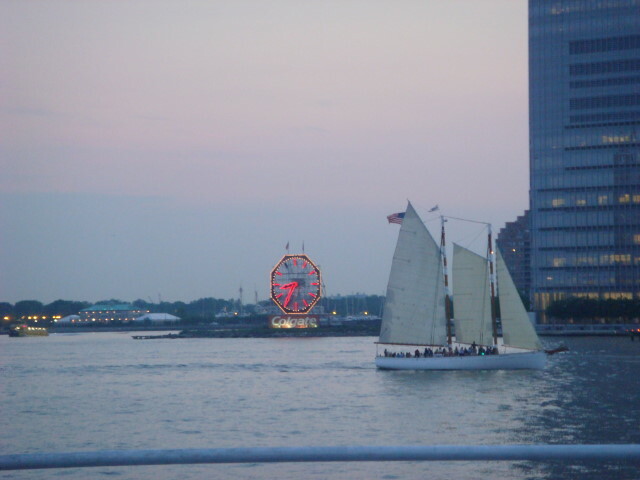 I went down to the South Street Seaport today to take a look. I had seen the early setup of one of them on the Brooklyn Bridge so I knew where to start looking. Sure enough, there it was on the east side of the Brooklyn Bridge. It’s a nice waterfall, but it ain’t Niagara. Of course, that’d be way too expensive even for NYC. 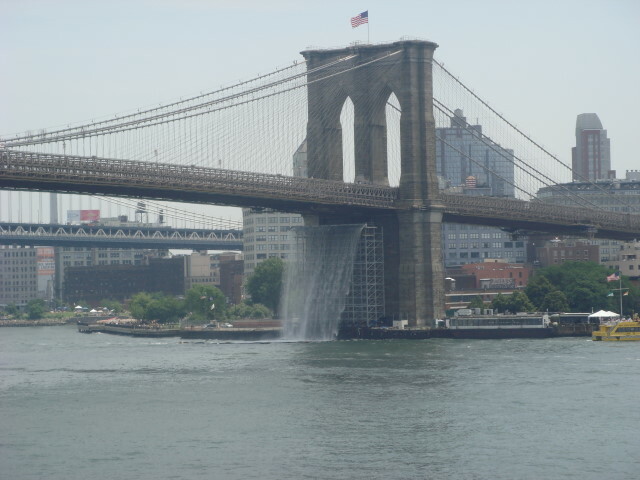 It looked a bit higher but less wide than the Brooklyn Bridge waterfall. 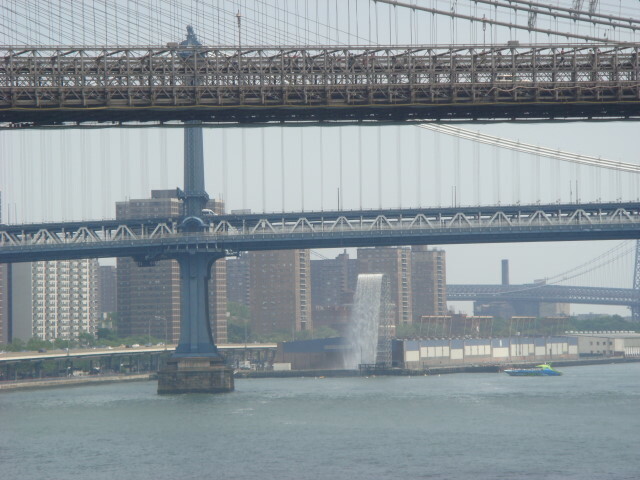 The second waterfall was on the Manhattan side of the East River. I wasn’t in the ideal spot for watching. I noticed two variations of watching it. First, just to the south of the waterfall, there seemed to be a viewing area. You can see by the next picture how good my zoom was for the picture. 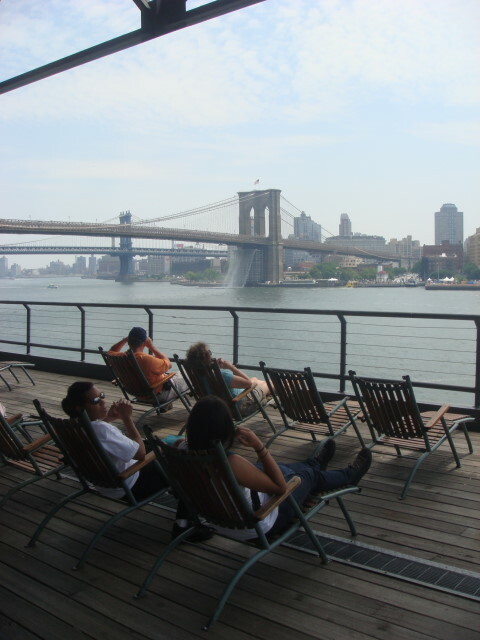 People were kicking back and relaxing on the third level of the South Street Seaport. The other great way to see the waterfalls appeared to be by boat. 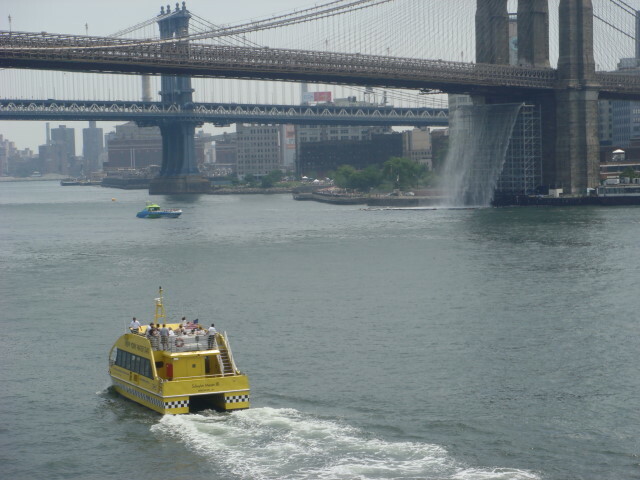 The New York Water Taxi and some tour boats were doing a bang-up business taking people out there. As I understand it, this will be going on for the next five months or so. Maybe I’ll get over to the other side to see it. But maybe not. Like I said, it’s no Niagara. 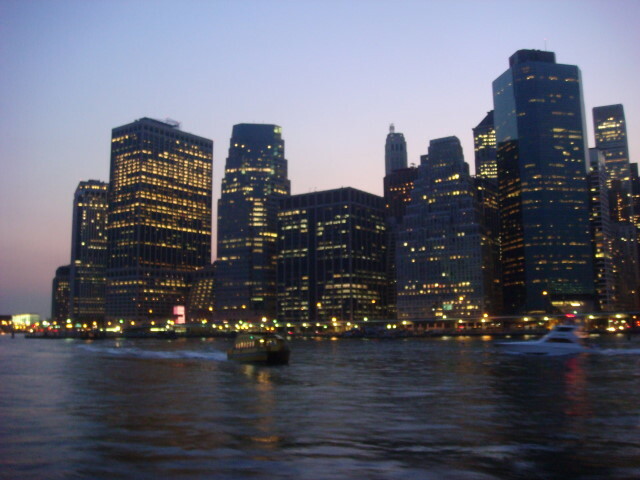 I recently got the chance to go on a work-related boat cruise around Manhattan (well, actually, only about a third of the way and back) and did have my camera. Being Famous Ankles, I spent a lot of the trip just snapping pictures. There’s not much of a storyline to the photos, so I’ll be brief. Oh, and I got a lot of pictures. I’ll break it into a number of posts, but I won’t do my usual consecutive postings with “Part 1”, “Part 2” and so-forth. Just the occasional post when I feel like it. We started off on the World Yacht pier at about 41st and 12th Avenue. No point in describing the boat. It was nice. 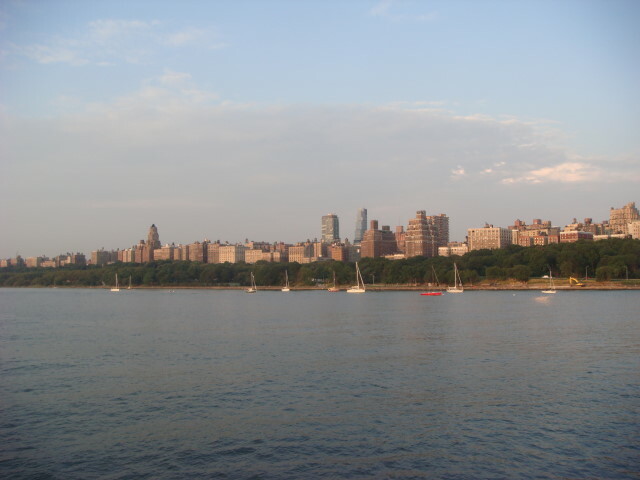 It started by heading north to the Upper West Side. The next picture is still in Mid-Town West, though. Another Mid-Town West shot (mid-town is in the 30s or so to about 59th Street). This is a view I’ve seen many, many times: kayakers. 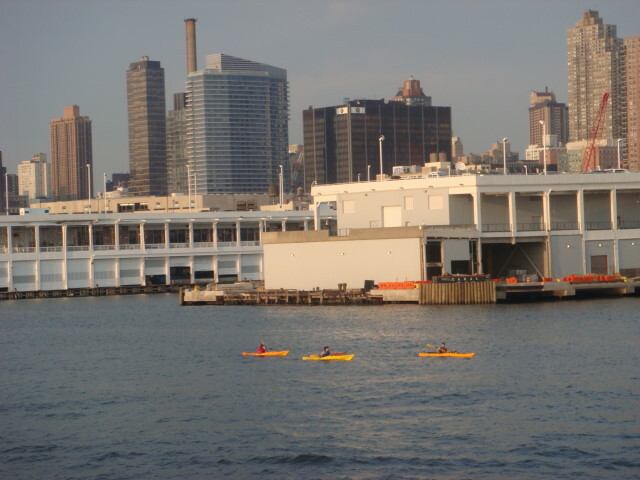 It is always cool to think about how popular kayaking is on the Hudson River. Of course, with 8 or 10 million people in the NYC area, three kayakers does not a massive trend make. My old stomping grounds. This is the view of Trump Place. Some of the Trump Place buildings are rental, others are condos. 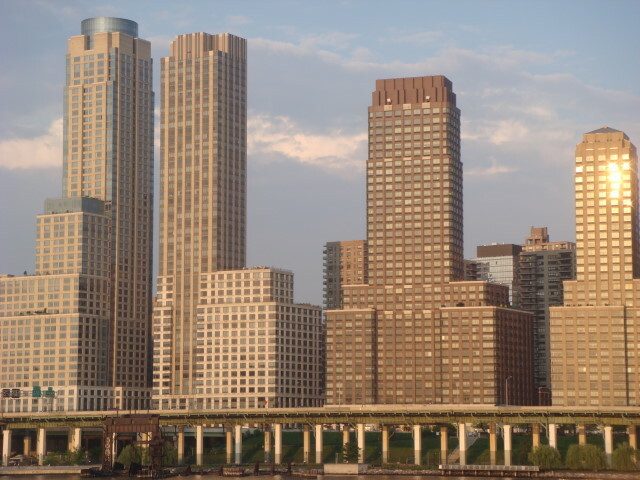 At the far left, the tall building with the circular structure on the top is one of the condo buildings and is one of the more iconic Trump Place buildings. Here’s a marina that is just to the north of Trump Place. Incidentally, this is probably around 80th Street if you want to know. Another shot of the marina. The highest we got was just north of the marina. 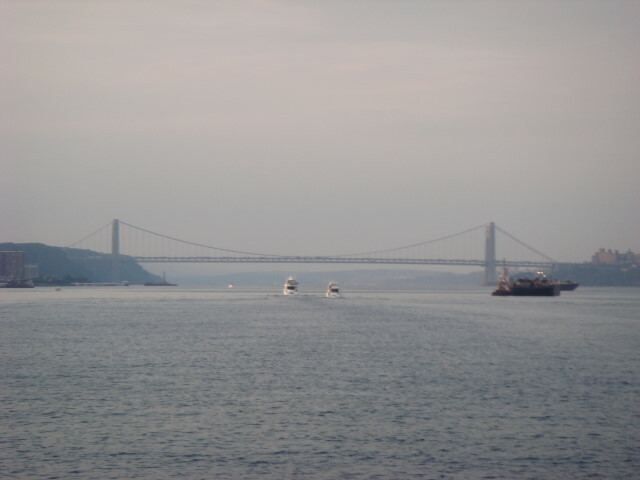 I did max out my 5x telescopic lens (built-in) to get this picture of the George Washington Bridge in the distance. I’m surprised it came out as well as it did. The sun was starting to go down when I took this next picture. (Okay, okay. I took a lot more in between, but they’re redundant or not as good as the ones I’m showing.) That’s the Empire State Building in the distance. It’s located midway across Manhattan. I tried to frame this right, but chopped off the top of the Empire State. There were a number of boats on the water, but not as many as the warm Friday night would normally bring out. Probably gas was too expensive. What can I say? 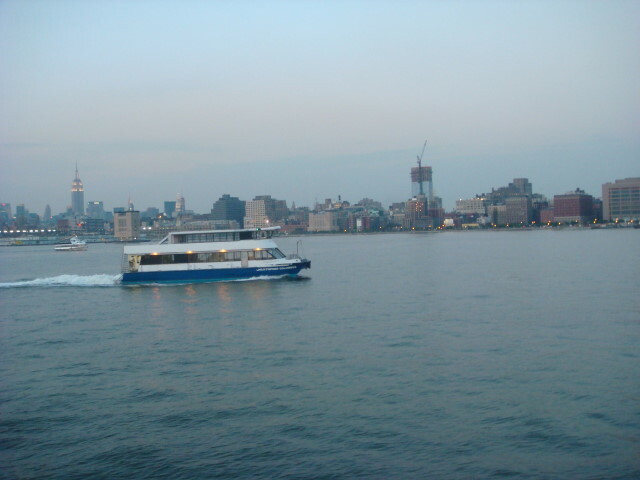 Chelsea Piers at twilight is a good way to describe this next picture. The “frame” on the right part of the picture is the golf driving range. I took so many variations of this shot! This isn’t the best, but I’ll post another or two at another date. But the view is wonderful. 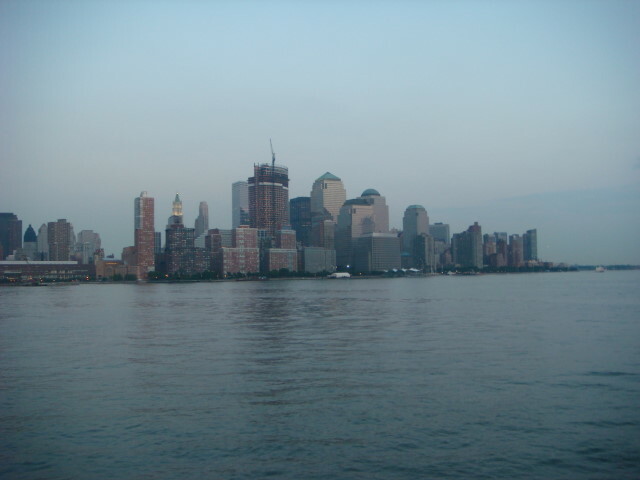 This is southern Manhattan. A few years ago, you’d have seen the twin towers. 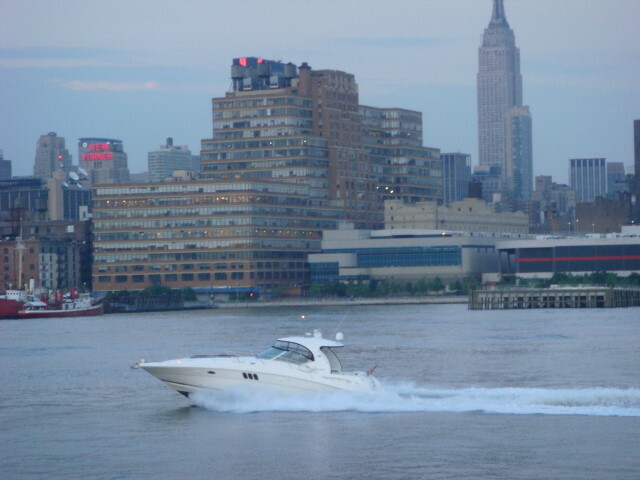 Here’s another shot of Chelsea Piers, this time with the Empire State Building in the background. Incidentally, Chelsea Piers is in the 20’s. 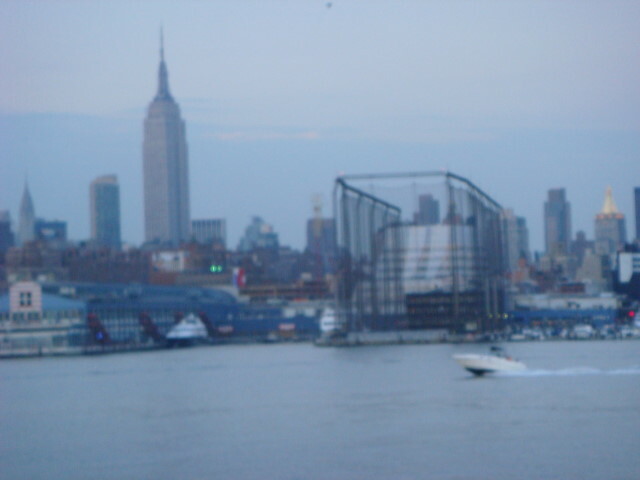 It’s a bit fuzzy, but I wanted to have the boat in the picture, too. 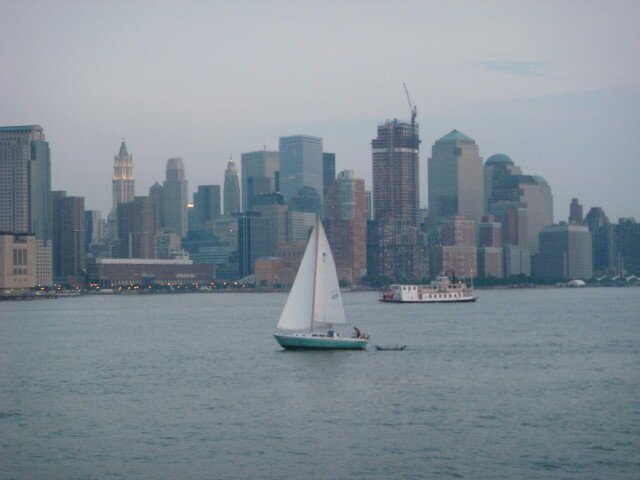 Last picture for the day: southern Manhattan with a sailboat. 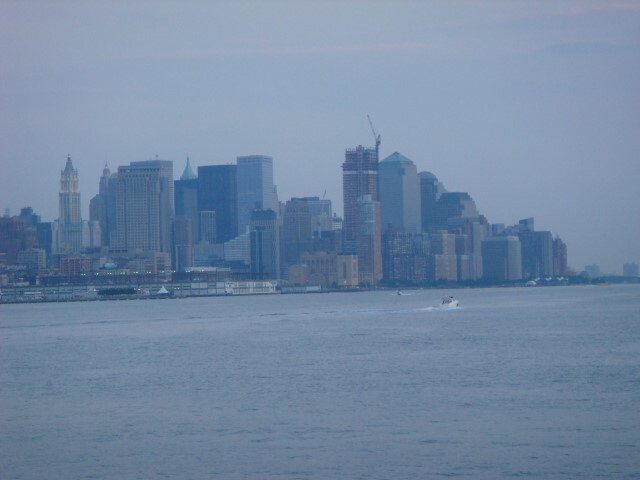 I’ve put a statement in this blog a number of times: if you visit, take the Circle Line Cruise. Take the long one! It goes completely around Manhattan.